In a way, I was lucky when I moved onto James. I had just moved out of my marital home after an unreconcilable breakdown of my marriage. I took very few material possessions with me; a suitcase stuffed with clothes, a collection of my favourite kitchen knives and, bizarrely, my hiking equipment. James, for a narrowboat, has plenty of storage space. There’s a large cupboard with bookshelves above either side of the front doors, under-seat drawers where the l-shaped lounge seating is, more under the seats in the dining area, shelves and cupboards under the kitchen sink and work top, two five drawer chests in the bunk area (my office), a cupboard under the bathroom sink a wardrobe in my bedroom and six drawers under the bed. Plenty of storage. Over the last two years I’ve filled some of the space but I still had plenty to spare. I filled all of my book shelves with my favourite paper and hardbacks but then, when I discovered the Kindle, storage space for reading material wasn’t an issue. 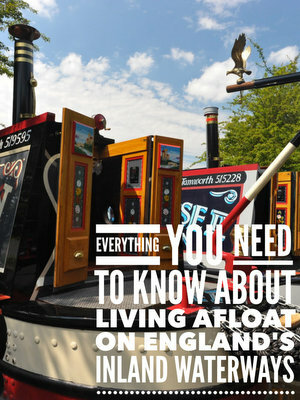 I was a single bloke with relatively few material possessions living on a fairly large and well-appointed narrowboat. You can imagine my shock recently when I was faced with the same logistical problems that most new liveaboards encounter. I met Sally just over a year ago. I’m pleased to say that we get on very well indeed. In fact we get on so well that we’ve spent all of our time together for most of the last year either on the boat or at her house nearby. Mostly on the boat. Sally loves James. Sally’s two spaniels, Daisy and Charlie, love James and the marina even more. The next logical step was to move in together. 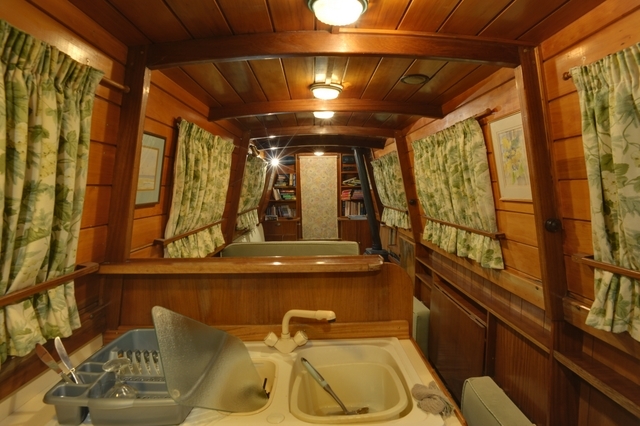 As we all love the boat (and as writing content for this site would be both hypocritical and pointless from the lounge of a three bed semi), we decided that everyone would be better off afloat. “It won’t be a problem”, said Sally. “I don’t have much stuff”. It’s true that she doesn’t appear to have much in the house. She’s ultra tidy and a million miles away from being a hoarder. But she does live in a house. It’s not a huge house but it’s still a house with three bedrooms, two bathrooms, a lounge, a kitchen, a conservatory, a cloakroom, a garage and a garden with a little shed. Every room, no matter how tidy and sparsely furnished, has stuff in it. Sally’s been very good about it all, but I think she’s about to have a breakdown. Her life is in her house. There are memories everywhere. Framed photographs of her two grown children adorn the walls. Meaningful photographs; graduating from university, holding a youthful labrador that’s sadly no longer alive, young and innocent smiles on sunny holiday beaches… the list goes on and on. She has beautiful furniture. Leather Chesterfields and oak coffee tables, display cabinets full of crystal glasses, solid oak book cases (filled with books) and a work station complete with a desk tp PC, BIG monitor and an all-singing-all-dancing printer/scanner/copier/teamaker. She has oriental rugs and mats, beautiful curtains by the score, king size duvets with set upon set of matching covers and pillow cases, and she has clothes. Lots of clothes. There are racks of beautiful clothes, dozens of hand crafted hand bags and clutch bags and a whole heard of designer shoes. Sally loves to cook. She has every item of kitchen ware that could possibly be of use in the kitchen. There are pots and pans of every conceivable size. There are dainty little pans for sauces, steamers, pressure cookers, omelette pans, frying pans, and one enormous affair that, at a push, I could take a bath in. She has peelers, mincers, dicers, juicers, cutters and presses. She has enough knives to outfit a small army. She has a great deal of crockery. There are sets of serving dishes, serving plates, dinner plates and side plates, soup bowls, dessert dishes, dishes for sauce and dishes for gravy and one enormous platter that probably needs a team of four to carry it. Sally enjoys gardening. She enjoys gardening because she has the tools to make the job easier. She has wheel barrows and barrows on balls, spades and forks, rakes and hoes, shears and secateurs. She has pots galore. She has a garage. A very well organised and clutter free garage. There doesn’t appear to be much in it… until you look up. The rafters have been boarded to create storage space above. There’s a full set of alloy wheels for her son’s VW, two oak display cabinets that wouldn’t fit into her current house when she downsized, mops, hard brushes, soft brushes, brushes with long handles and brushes with short handles, a couple of brushes with no handles at all, a dog travel cage, work benches and tools, three sets of ladders, a collection of thick embroidered rugs, paint and paint brushes, trays and rollers and a full garden furniture set. So what do we do with a lifetime’s accumulated household essentials? Firstly we discussed what we could reasonably fit onto the boat. Don’t forget that James is reasonably large and has plenty of storage space. Her clothes and shoes are essential of course, but not all of them. Not a chance. I don’t need much space for my clothes, so Sally has the lion’s share but even then, there isn’t space for a fraction of her bags, shoes or clothes. And there’s not much room for anything else at all. There’s no room for any of the furniture, gardening equipment or stuff from the garage. There’s very little room for anything from the kitchen. After much deliberation we’ve picked just a few of the more frequently used pots and pans and some of the kitchen tools. That’s it. Where is everything else going to go? That’s the $64,000 question. The short-term answer is to put it into storage. It’s not a cheap option though. We’ve been quoted £150 per month for an inadequate eighty square feet and a far more reasonable £70 PCM for two hundred square feet. The problem is the cheaper, more spacious storage is in short supply. We may be able to reserve one of these damp-free and secure containers in about two week’s time. I’ll keep you posted. I wrote this post just over a year ago when we were trying to decide what to do with the contents of Sally’s three bedroom house. We did in fact rent a “half” container. It’s 20′ long and 10 feet wide. On one of my days off with Sally’s son Michael and daughter Maricar to help we rented a box van and moved most of the contents of her house into the container. Sally gave quite a lot to Michael and Maricar to help furnish their homes in Nottingham but by the time we had finished, every square inch of the container was full. Well organised and with everything accessible but still very full. Over the first couple of months we visited the container two or three times a week to get essential items we couldn’t or didn’t want to store on the boat. Over the following months we visited the container less and less. I think our last visit to the container was about two months ago. We don’t really need the container. It’s an unnecessary expense. It’s cost us £910 so far, about the same as the license for James. All of the really useful stuff originally stored in the container is now somewhere on the boat. The container is only two miles away from where we’re moored at Calcutt but there’s still too much effort involved to make a visit worthwhile. I think we should dispense with the container but that will meaning getting rid of all of Sally’s accumulated possessions. It’s a decision she has to make herself. I won’t get involved (apart from to point out that with the money she saves she can buy herself a ticket to visit her much missed family in the Philippines).